Copper Rotors - THT Presses, Inc.
With THT’s New Breakthrough Technology for copper rotors you can now utilize copper rotors to gain energy efficiency without incurring the prohibitive upfront costs needed to produce them!!! Using copper rotors in lieu of aluminum rotors provides the optimum solution for energy efficiency. However, in the past copper casting for most applications was cost prohibitive due to the higher costs of the material, as well as the higher melting temperatures needed for casting, which caused problems with molds and tooling. With THT’s new breakthrough technology, copper can now be used in many rotor applications cost effectively. With THT’s new technology, we can produce the copper rotors in our facility for you. 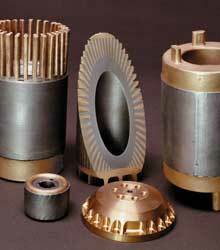 The return on investment in copper rotors can be realized quickly in various applications. With THT’s laboratory and R & D capabilities, we can help you develop your copper rotor application from concept through production. We can design your tooling and produce your castings on our machines during the design phase through production.